Ken Ildefonso is the first to run into the Long Island Sound at Compo Beach in Westport, Conn., during the Team Mossman Polar Plunge to benefit Save the Children, Tuesday morning, Jan. 1, 2013. Natalie Titova Campos, her dog, Kenbol, and Alena Matveeva use paddleboards rented from Young Mariners at Harbor Point on Friday, July 5, 2013. Mimi Sue Novak, 8, gets a pull from Millie as she skates on Gorham's Pond in Darien on Saturday, January 27, 2013. Stetya Jean Baptiste dances her way to the podium to get her diploma during the Stamford High School commencement ceremony on Thursday, June 19, 2014. Mariya Pychil practices ballet during a lesson at The Ballet School of Stamford on Thursday, March 14, 2014. The school is a recipient of a grant from the Community Arts Partnership Program. 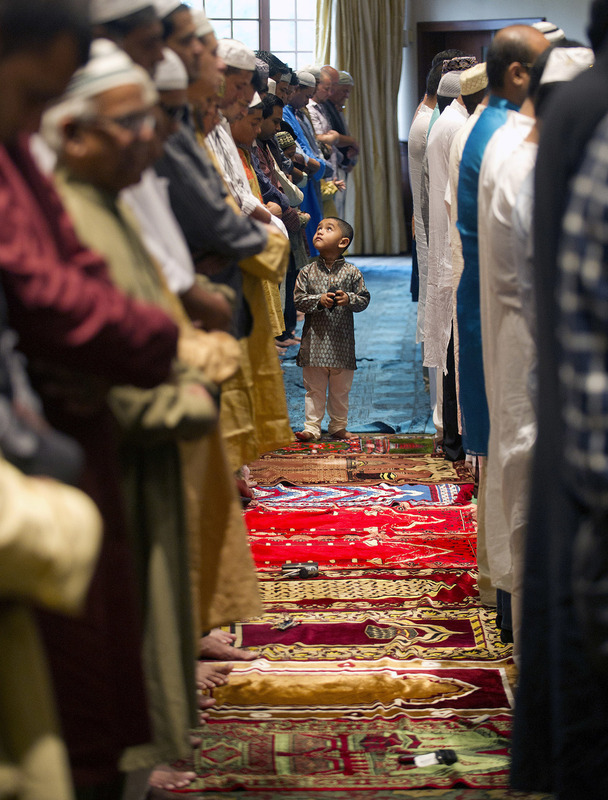 Members of the Stamford Islamic Center participate in Eid al-Fitr prayers to mark the end of Ramadan at the Italian Center in Stamford, Conn., on Thursday, August 8, 2013. Jane's Addiction plays during The Gathering of the Vibes festival on July 23, 2011. Stephanie Katz picks up her daughter, Nina, as Rob Winslow's daughter, Abby, runs into his arms during the Westport Age Group Track Meet on July 7, 2011. Gregory McNamara fishes in the water of the Long Island Sound at Shippan Point in Stamford, Conn., on Thursday, May 30, 2013. Christopher Puchala, 11, catches some air as he sleds off a giant mound of snow created by plows in Westport on Wednesday, January 12, 2011. LeeAnn Czujak, 7, of Seymour, picks blueberries with her father at Jones Family Farms in Shelton on Thursday, July 22, 2010. Cameron Blair plays John Proctor and Allie Lemeikle plays Abigail Williams during a dress rehearsal of the play "The Crucible" at Brien McMahon High School December 14, 2010. James Geaney, 3, collects leaves while on a walk with his mother, Jennifer, not pictured, on Szost Drive in Fairfield on Friday, November 12, 2010. Morgan Sylvia, 6, whispers what she wants for Christmas in Santa's ear as her sister, Darby, 3, listens during the Ludlowe Center for Health & Rehabilitation in Fairfield. A pedestrian walks along Soundview Drive in Bridgeport on Friday as a light dusting of snow began to cover the street and the sun set on December 10, 2010. Elvis Costello performs during The Gathering of the Vibes festival on July 23, 2011. Cookie Monster reaches for a plate of cookies after Stamford Mayor Michael Pavia proclaimed April 17, 2012, "Sesame Street Live Day" in advance of three perfomances at The Palace Theatre. Former President Bill Clinton is silhouetted against the American flag as he speaks about his wife, Senator Hillary Clinton, at Ohio University-Chillicothe on Monday. Scott Lamelin, Musical Director, plays the organ at Wesley Methodist Church. He said the famed Skinner organ was one of the things that attracted him to the job in Worcester. Destiny Howard, 8, the last girl standing during a game of "Star Wars," gets a hug and a high-five after beating the boys. A boy holds on to his father as he is dropped off for the first day of Kindergarten.